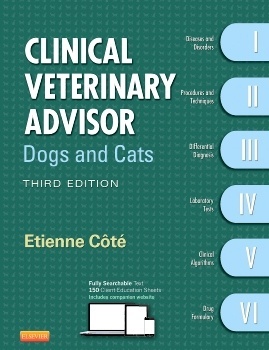 No other quick reference comes close to Clinical Veterinary Advisor: Dogs and Cats at providing you with the information you need, when you need it! Like getting six books in one, this third edition is completely updated and features dozens of all-new chapters to keep you ahead of the latest topics. Plus, you get free online access to a fully searchable version of the book, including all of the images, bonus chapters, dozens of clinical video clips, a drug formulary, and 150 client education sheets in both English and Spanish. With this amazing print and online duo, you can keep the book at the office and access the online content on your smartphone, tablet, or laptop any time, any place - all for one low price!